In this post you’re getting two videos for the price of one (considering they’re all free for now, that’s a good thing). I put together a relatively simple dashboard to help illustrate a few intermediate level concepts. 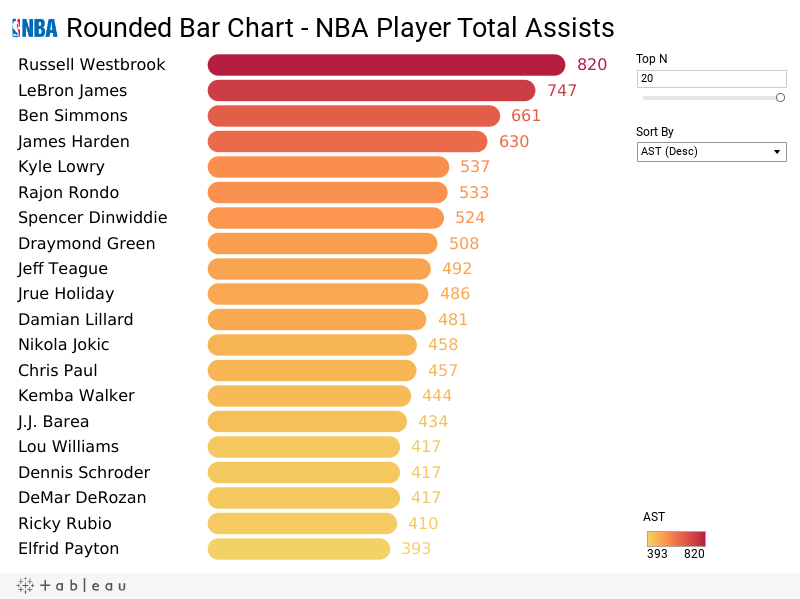 In this first video I take a look at the number of total assists by NBA players during the 2017-2018 season. In case you were wondering, Russell Westbrook led the league in assists during that season. If you don’t know who Russell Westbrook is, then skip this Tableau stuff and watch the last video immediately (and then come back to the Tableau stuff). In the second video I build upon the dashboard built in the first video by showing you how to add a custom sort. The custom sort relies upon the creation of a parameter and a calculated field. The parameter and calculated field enable the user to select either a dimension (e.g., Player Name) or a measure (e.g., sum of assists) from a drop down box and the visualization will sort ascending or descending as requested. The calculated field relies upon the RANK_UNIQUE function. In this context, RANK_UNIQUE returns the unique rank of each player’s assist total. The key with RANK_UNIQUE is that identical values are assigned different ranks. As an example, the set of values (6, 9, 9, 14) would be ranked (4, 2, 3, 1), as no tied rankings are allowed. For those of you who do not know who Russell Westbrook is, I’ve got you covered. These aren’t assists but in these situations, he didn’t need to pass! Thanks to both the Tableau Magic blog for outlining the concept of rounded bar charts and the VizJockey blog for the custom sort methodology. Check out and support these blogs! As always, do great things with your data!